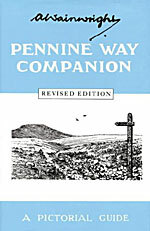 The main difficulties of travellers on the Pennine Way are concerned not with the nature of the terrain but with finding and following the approved route - not with walking but with navigation over untracked moors and negotiation of the maze of walls and fences in the valleys, more than half the distance being without visible footpaths. The principal object of this Guide is to enable walkers to follow the Pennine Way without putting a foot wrong; or, if this aim is too wildly ambitious, at least to ensure that they do not go seriously astray, or trespass, or lose valuable time on false trails. This book contains * a continuous strip map of the route on a large scale (2.5in. - 1 mile) extending to 84 pages and showing walls and fences, also indicating gates and stiles in places of doubt; * a running commentary on the route (with a little mild leg-pulling); * 300 drawings of places of interest; * a skeleton log of the route for the personal use of the walkers, to provide a record of their daily performances; * suggestions for those who have not the time or the energy to undertake the walk as a single expedition and prefer to do it in short sections, as and when convenient; * many novel and helpful features. This book is printed throughout from photographed reproductions of the author's original manuscript.